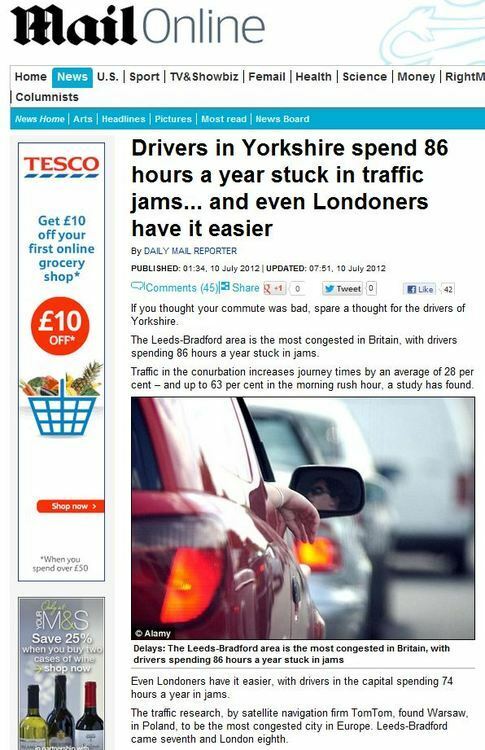 If you thought your commute was bad, spare a thought for the drivers of Yorkshire. The Leeds-Bradford area is the most congested in Britain, with drivers spending 86 hours a year stuck in jams. Of course, if this poll hadn’t found Yorkshire to be the worst for traffic jams, it would have found somewhere else – the story would have been identical, with one word changed. It’s clear to see how this could appeal to a PR company, who could have their entire story written before the data even comes in. Who placed this story in the papers? Harold Goddijn, chief executive officer of TomTom, said: ‘Over the years, with the help of our customers, we have built the largest and most accurate database of travel times in the world. So, essentially: ‘traffic jams are bad, if only you had a product like ours that would allow you to avoid them’. This entry was posted in Uncategorized and tagged daily mail, Harold Goddijn, Tom Tom on July 17, 2012 by Michael Marshall.